Most of the activity on the TORn Discussion Boards is still on The Hobbit Board. As an outlet for the excitement, posters are contributing the various levels of observations they make while watching TH:AUJ to the development of TORn’s “Geeky Observations List for The Hobbit: An Unexpected Journey.” Everything spotted in the film that’s deemed “geek-/note-worthy” is posted on threads specifically contrived to gather these precious jewels and tidbits. They will ultimately be organized and settled on TheOneRing.net’s Geeky Observations List site where Lists for The Lord of the Rings‘ 3 films are already housed. Come join the fun and share YOUR geeky observations here and in upcoming threads. Check out these past threads to get an idea of what is going on. Following our preoccupation we have with The Hobbit as it is still playing strong in theatres, we can’t help but share our favorite scenes. Let us hear about yours here. TORN poster DanielLB’s weekly report on Want Hobbit Movie News? from the Hobbit Discussion Board will be delayed while he is out of town for a spell. 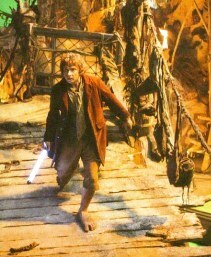 Watch for his jam-packed collection of weekly Hobbit news to return early in March.